By the 1850s bracelets had become an indispensable accessory. The French connoisseur Edmond Joly de Bammeville declared that the ‘daytime’ bracelet was the ‘main feature of national dress’ in England. Up to seven or eight of differing designs might be worn between the wrist and elbow on both arms. Alternatively, they could be worn in pairs and even over gloves. Distinctions of rank, age, occasion and dress determined what jewellery could be worn and when. One etiquette manual stated that diamonds, pearls and emeralds were for full evening wear only. In the daytime, women were expected to wear less elaborate jewellery. 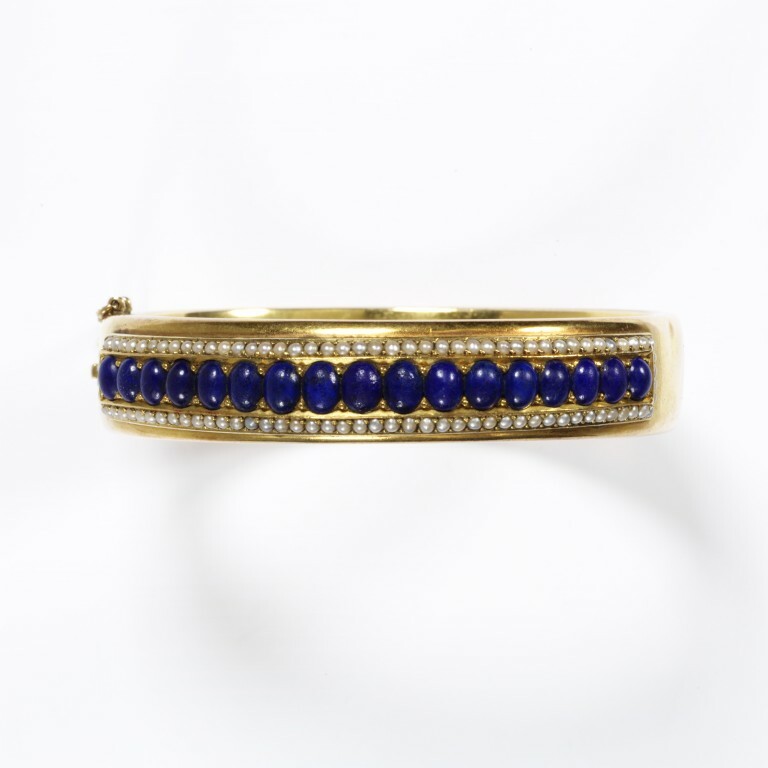 Gold half hoop bangle set with a rectangle of split pearls around a line of cabouchon cut lapis lazuli stones. Engraved. Alice Coralie Glyn was the sister of R.R. Glyn .